Decorative Life: Many weeks to months in flower, and many months to years without flowers depending on how it is treated. Common relatives include bromeliads, Christmas cactus, pineapple and Spanish moss. Yes, the same moss that is seen growing on trees in many parts of the world including many parts of southern and western US. Leaves stiff, spiny, mostly linear in a basal rosette and often colored, showy. Flowers borne mostly in spike-type inflorescences protruding high above the foliage. Some may classify this species as a foliage plant, mainly because of its tropical origin and the fact that it can grow for years without exhibiting flowers. About 246 species of mostly large, showy and mostly epiphytic herbs. As “epiphytes” or air plants, they grow on other plants and elevated supports. They are not parasites but obtain water and nutrients through a spongy covering of their roots. Grown outdoors or in greenhouses for the often brilliant and long lasting flowers. Also known for beautiful foliage. 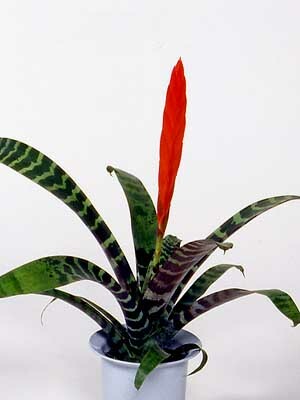 Most bromeliads only flower once under home/office conditions. However, if new off-shoots are produced, it is possible to induce them to flower by treating the plant with ethylene gas. To treat a plant, place one or two ready to eat apples next to the plant and them seal the plant and apples in a plastic bag. Keep the bag sealed for two or three days at room temperature. Remove the bag and apples. It may take many weeks before you will know if the treatment was successful. One of the most hybridized genera of the family. Will generally grow well in light levels bright enough to read a newspaper in comfort. Named after Dr. W. H. de Vriese, 1806-1862, a botanist located in Amsterdam. Most cultivars can survive under a wide range of light conditions.